JiangNanChun in Four Seasons Hotel invited Chef Wang Yong from Four Seasons Hangzhou to “pop-up” here for a limited time only display of specialty Hangzhou/Shanghai cuisine. Chef Wang Yong hailed from the newly opened Four Seasons Hotel Hangzhou at West Lake. Within his first year there, the hotel’s Jin Sha restaurant was awarded one of 2011 Best 50 Restaurants in China. They brought their best selling dishes including the Braised Pork Belly 东波肉, Sauteed River Shrimp with LongJing Tea 龙井清炒虾仁, and several others. We went for a tasting. Strictly speaking, in the region of Jiangnan (or literally South of the Yangsze River) are 3 main groupings of Chinese cuisine – Shanghainese, Hangzhou and Jiangsu styles of Chinese cooking. In general we refer to them as JiangZhe cuisine – sweet, savoury, emphasis on the technique of braising and slow cooking. This has to do with the abundance of the regions and the scholarly nature of its history. Scholars of Jiangnan would rather be poets and academics than officials or mandarins, or is that so? In recent historical finds, these scholars, talented as they may be, were not exactly cut to win the political race. My ancestor Tang BoHu, for one, was depicted as a Cassanova, highly gifted in painting and calligraphy, fantastic poet and had 8 beautiful wives. Actual fact: he was a fan seller by the river of Suzhou, gifted he may be, but he had only one wife throughout, and died a pauper. And I digressed. The reason I spent so much time exulting the history of the place is that I want to highlight that these people really had time on their hands to prepare some of the best food in the country. They had plenty of river fare and easy access to sugar and soy. This helps them to develop one of the best use of soy sauce, sugar and yellow wine in cooking. Take the Braised Pork Belly Dongbo Style 梅菜东波肉. By braising the pork over slow fire in a stock of yellow wine, soy sauce and sugar, the fats of the pork belly were transformed to another state of tastiness, which if left in its original form would be inedible. The fats had turned to a creamy texture, the skin caramelised by the slow-cooked sauce while the meat retained the firmness. 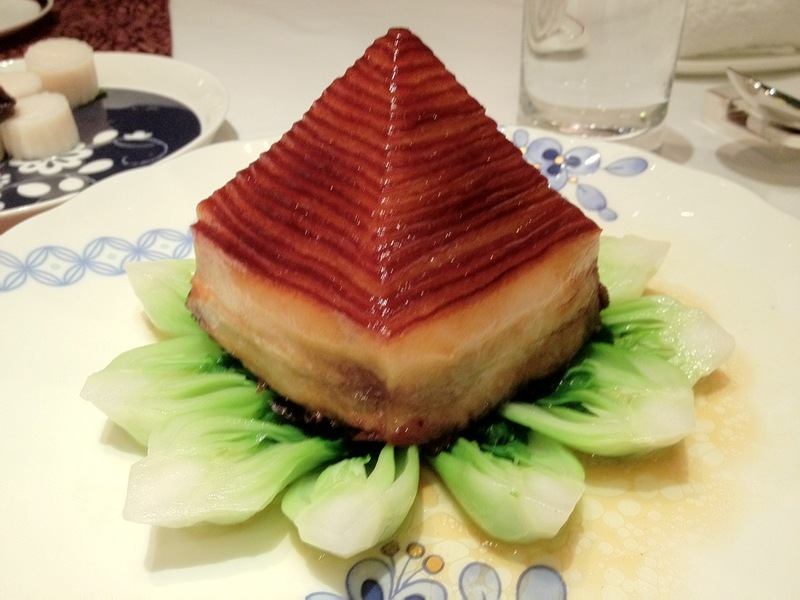 And the knifework – an entire cube of pork belly was sliced sideways and pushed in the middle to form a pyramid. This showed the complete control of the cooking time and technique so the belly would not be too soft for the knife (the usual case in other restaurants or at home). And coupled with the pumpkin buns and preserved vegetables 梅菜干, this becomes the childhood favourite that we knew 梅菜扣肉包. At $36++ per serving, this was worth every bite. This was a mixture of pork, toufu and shrimp – yes, toufu. This is then simmered in a clear chicken stock – yes, it is not cooked in its own broth. The end result is a complex tasting Meatball that is delicately balanced and not “meaty”. 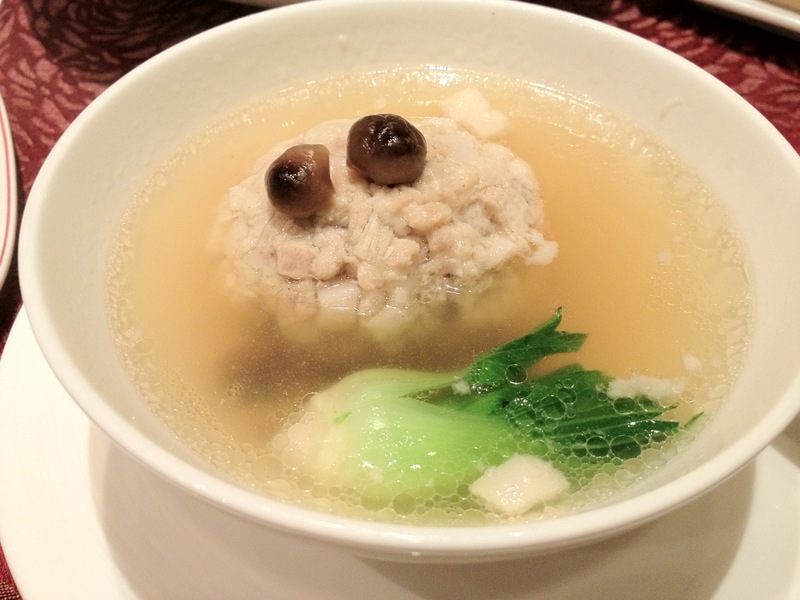 Imagine your seafood soup condensed in a meatball. $18++ per ball, not exactly cheap as it is about the size of a tennis ball. Again the taste compensated for the price. The rest of the dishes was not outstanding, perhaps because they adjusted to local taste of less oil, less sugar and less salt to be inline with the Health Promotion Board. This caused the dishes to be bland, under salted and in some cases, lost the original flavour. Take the Noodle Szechuan style – they used local mee pok as the ingredient and that totally ruined the taste. The spirit of a Pop-up – a guest cook in someone else’s restaurant – is to retained the original flavour in a totally foreign environment. In this case, Chef Wang had tried to adapt to local taste – a big let down for well-travelled Singaporeans like myself. I am sure we are far more adventurous then this.